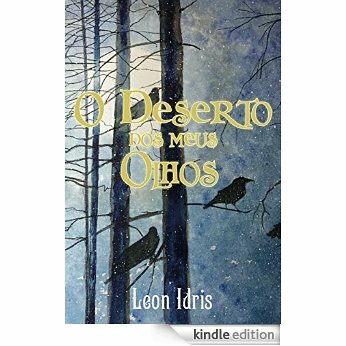 Leon Idriz Azevedo is a Brazilian author who requested the use of the painting “Raven Moon” for the cover of his recent Novel “The Desert of My Eyes” (“O Deserto Dos Meus Olhos”). The Novel (currently available in Portuguese) finds the main character, Rupert Lang, thrown into a historic quest to seek the remains of what he stumbles upon as a ‘lost identity’ — taking him through ‘the Spanish court of the reign of Isabel II, the streets of Prague Johannes Kepler and the halls of a Buddhist temple built on a cliff in China’. A miniature of the new book’s cover has just been painted and is wending its (slow, ship-bound way) to Brazil, with best wishes and hopes Mr. Azevedo receives great reviews and even greater public readership of this new adventurous Novel. My hope is that I’ll soon be able to read it in English. ….thank you so much Elena. Your work is superb. Congrats on the cover! It looks great! How cool is that? Looks great! awesome sir…. congratulations in any language. One more congratulations Lance, nice feather in your cap. If the book reflects this beautiful art, it must be a good read. HOLY SMOKES! I can’t even begin to respond to all these encouragements! Thank you Kirk, Lemony, Laura, Cynthia, Andrew, Eileen and Travelosopher (I hope you do someday go to Cuba)! You are such a great support to me, all. How fun!!! (and fantastic and wonderful and exciting, but all those words were already taken. :)) I love narrative art so much, that it’s really … lovely… yes, lovely when painting and writing meet. Yay. That’s a great cover. Good work. I love that painting, Lance. I wish I had beat him to it, for the cover of my next book. Bravo and bravissimo! Yay, Lance! And boy, he chose a beauty, didn’t he? This is one of my favorites of yours. Congratulations! Very exciting! Oh I’d love to see your nighttime paintings in particular on suspense works. Wow, that would indeed be great. Thanks for letting us know about this! Fantastic! Way to go, Lance.